What is the exclusionary rule, and why does it exist? The Fourth Amendment: "The right of the people to be secure in their persons, houses, papers, and effect shall not be violated, and no warrants shall be issued but upon probable cause, supported by oath or affirmation, particularly describing the place to be searched and the persons and things to be seized." Originally, it meant no "writs of assistance", in which judges waived the right in an entire area to allow the king's men to search everywhere. In Britain today, it meant that victims of illegal searches could sue for confiscated items and for the search itself. However, in the United States, the remedy for illegal searches went through a different phase. Although the Fourteenth Amendment applied to the states, the Fourth itself only referred to the federal government in 1886. When it subpoenaed to produce incriminating evidence, the Supreme Court would not allow it because it violated the Fifth right against self incrimination. When federal agents illegally seized evidence in the case of Weeks in 1914, the Supreme Court found its remedy in the exclusionary rule. All evidence became inadmissible in all parts of the criminal justice system. The burden fell upon the prosecution to prove that it would have seized the evidence another way legally. There were three reasons for the exclusion: it is a fundamental right "The right ...shall NOT be violated...", the judge did not authorize it with a warrant, nor was there exigence (no time for a warrant), and finally, to deter police misconduct. Keep in mind, at the time, most of the federal agencies, particularly the Federal Bureau of Investigation, did not exist. At no time did this rule interfere with the administration of justice. 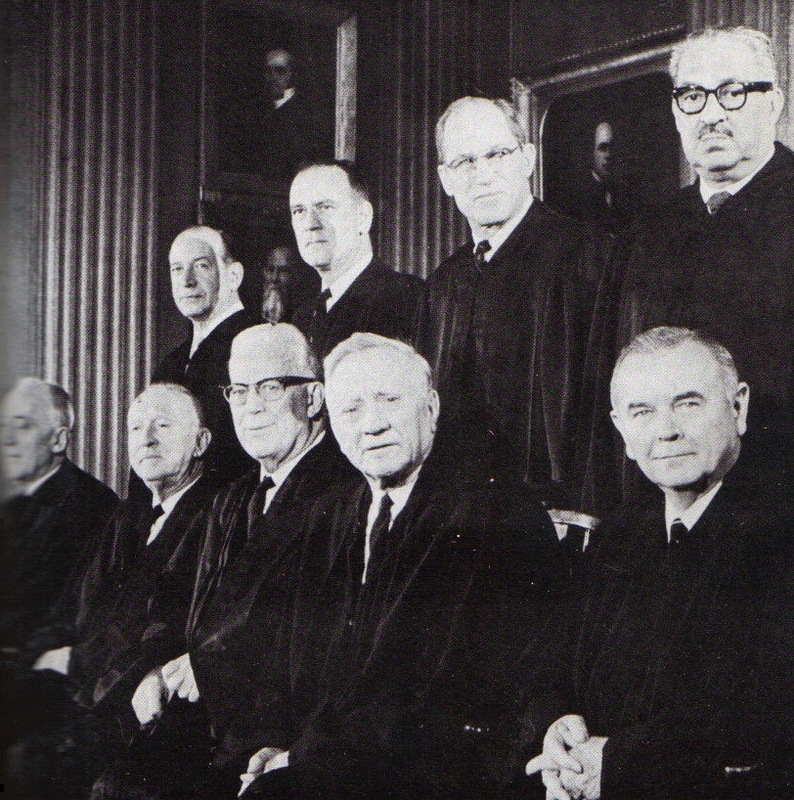 In 1961, the Warren Court extended the rule to the states in state courts. Previous decisions showed that the states could abuse the fundamental right with impunity, and the federal government refused to punish state officials who abused federal rights. Therefore, Mapp vs OH applied the Fourth Amendment and the exclusionary rule to the states. That should have been the end of the story. Then Nixon placed his Gang of Four on the Supreme Court, and the excuses to crooked cops began. ; First, (Calandra vs US, 1971) began to whittle the exclusionary rule as a remedy SOLELY to deter police misconduct. Once this nonsense was in place, the rest followed. There are a few problems with this approach. First, the precedents do NOT support it. Which part of "shall NOT be violated" did the Nixonites NOT understand? This nonsense led to the "good faith" excuse to the exclusionary rule, and it reaches ludicrous portions in IL vs Krull (1987). In 'ill and cruel", the Gang of Four and White refused to use the exclusionary rule when the search law later showed to be unconstitutional. The excuse was that exclusion would not deter legislatures from passing illegal search laws. They lost O Connor on that one. How do the cops know that the search laws are unconstitutional until a court so declares it? What it comes down to is that the entire theory is wrong! The exclusionary rule has THREE reasons: as a personal right of privacy, to disallow a search which no judge allowed in the first place, and to deter the police. As Mapp and Weeks before it show, it is absolute because the Fourth says so. A strict constructionist does not see anything in the amendment about "shall not be violated, unless it does not deter police". My take on this is that the Nixon-Burger Court tried to limit the exclusionary rule to replace suing the police. Now, Hudson seems to limit it even further. The Independent Source Doctrine would pass in the Warren Court. The exclusionary rule does not extend to any legally seized evidence, even though it might have been seized illegally earlier. The prosecution may use it if it would have been obtained legally otherwise. The Inevitable Discovery is more nebulous, but it also follows that the prosecution may prove that the fruits of an illegal search may have been obtained otherwise legally. The Attenuation Doctrine resulted from the perversion of the exclusionary rule as solely to deter the police. The exclusionary rule did not substitute for lawsuits to return illegally-seized evidence. The most comical application of the deterrence doctrine came in 1987 under IL vs Krull (ill and cruel) in which the Nixon-Rehnquist Court allowed illegally-seized evidence under search laws later proved unconstitutional because the exclusionary rule did not deter legislators! They lost Sandra Day O Connor, a former legislator, but they still had five for the vote. So how are the police going to know a search law is unconstitutional? Blackmun dodged the answer, so legislators may pass illegal search laws and get away with them until the laws are declared unconstitutional. This time police may make illegal stops, and should there be an arrest warrant, they can get away with the illegal stop? So Thomas plods alone to allow the seized evidence (Search incident to arrest is not in question.) because there had been a legitimate arrest warrant on the defendant, even though the stop had lacked an articulable suspicion under Earl Warren's opinion in Terry vs OH (1968). Not only does it violate the Terry rule of stop and frisk, but also the longstanding rule of not allowing the fruit of the poisonous tree. The stop was illegal; therefore, no admissible evidence. Sonia Sotomayor wrote the major dissent and hints of going back to the original meaning of the exclusionary rule, which predates the FBI. Elena Kagan simply argues along the test of attenuation. The Court finds some excuse to allow evidence obtained from an illegal stop and frisk when there is no articulable suspicion. To paraphrase the jargon of Nixon and Reagan, the Court has decided to coddle crooked cops. There's yet another reason we push the Court from its lean to the right since 1970. Overriding this case, going back to Silverthorne and Mapp and an absolute rule would help, and while we're at it, reversing Citizens United would be a fine start toward reversing the trend economically since 1970 as well. The automobile exception does not permit the warrantless entry of a home or its curtilage to search a vehicle therein. Two incidents of traffic violations with an orange and black motorcycle led to further investigation that the vehicle was stolen. Checking further shows thatn Ran Collins had possession, so the officer traced the location through Facebook the location of the picture. From the street, the possible motorcycle was covered but had an extended frame and the the same angle parked. Officer photographed from the street, then walked up the driveway and investigated further by removing the trap and checking the license and number, confirming the theft. Officer photographed it, returned the tarp, left the property, and waited for Collins. The Court of Appeals confirmed on exigence. The Supreme Court of VA used the automobile exception. The scope of the automobile exception is limited to the vehicle. Thomas, concur, but without the exclusionary rule! Wrote both the exclusionary rule is not part of the Fourth nor applicable to the states. Alito, dissent, used the probable cause and expanded the automobile exception that it can be moved, not moving, as exigence. This Supreme Court actually upheld the privacy of the curtilage against warrantless searches in Collins vs VA this week. Sonia Sotomayer wrote the opinion which drew seven votes. At question was the area near the house as a zone of privacy, called the curtilage and the automobile exception as to exigence. They agreed that the police may not enter private property, even with probably cause, without a warrant, without exigence. The automobile exception fits the broad meaning of exigence but only when it's moving, not because it's movable. The lone dissenter of the case, Sam Alito, doesn't seem to understand that the motorcycle was movable, not moving. Furthermore, tarp covered it, so an officer would not see a license plate from the street. Even Scalia used to make such distinction between moving and movable. Scalito thinks officers can come on property, even though there is time for a warrant. Uncle Thomas wrote a peculiar concurrence, agreeing with the result while disputing the exclusionary rule. Like Scalia and his radical attack on Miranda rights, in Dickerson (2000) and allowing the fruits of an illegal stop in Strieff (2017), Thomas continues to complain about what the founders knew while upholding the right to own assault weapons. Using his own methods, anything Thomas says should be used against him in the court of public opinion. Even with the exclusionary rule, Collins will still pay the traffic violations and surrender the motorcycle to its owner. Next time Collins should buy items and get the title! He spent enough time in jail to think about it. Does a defendant have a reasonable expectation of privacy in a rental car in someone else's name? Yes, the driver was in lawful possession. Rakas vs IL referenced is instructive in determining the privacy interests protected by the Fourth Amendment and legitimation of expectations of privacy must have a source outside of the Fourth Amendment, either by reference to concepts of real of personal property law or understandings that are recognized and permitted by society. An observance with Byrd in which the Supreme Court finally clarified the privacy interests from Rakas in 1978 when the Rehnquisition muddled the difference between privacy and property interests. In Rakas, the majority opinion found no standing for the defendants to challenge the search. The court never simply decided that the case turns on the police had probable cause to stop the car and exigence to search the car for evidence of armed robbery. Because the lower courts brought up standing to exclude the evidence, the Court implied that to have standing, one must have a property interest. Nixon's Gang of Four and Stewart voted the majority. I also reviewed WY vs Houghton (1999) in which police legitimately stopped a car, which led to evidence of drugs. They found evidence in the purse of the defendant, one of the passengers. It was another close decision, ironically involving methamphetamines a few months after the murder of Matthew (Wayne) Shepard in Laramie and before the trial of the murderer. Stevens went along with Reagan's Gang of Four and Uncle Thomas because he believed the defendant's right of privacy during the search was solely on her person, not her purse in the back seat. So Byrd still had a right of privacy in a rented car not assigned in his name because he was in lawful possession and could exclude others. The Fourth protects privacy, not property. Without the drugs found in the trunk, he's free, although he still lost possession of the contraband. Such is the justice of the exclusionary rule. Byrd won't get back his time in jail either.